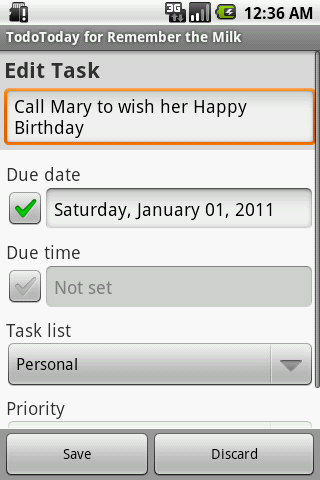 TodoToday for Remember the Milk 1.4.0 has just been released to the Android Market. This release brings a number of new features and enhancements; A new Edit Task option, the ability to Add Notes to a task, and a new preference to control the viewing of additional tasks in additional to the default of just Due and Overdue. Do you plan to add widgets to your TodoToday apps? Thanks for all the hard work. I'm looking forward to future updates! Thanks for the positive feedback. A widget is planned, and will probably be the next major new feature to work on. I'd welcome input on what users are looking for from a widget; list of top tasks, summary count of tasks, task entry widget, small, medium or large widget sizes?